Perhaps no other place in Germany embodies Adorno and Horkheimer’s idea of the “dialectic of enlightenment” more than Buchenwald. The concentration camp, which I visited for the second time last weekend, is located on the Ettersberg, a hill just five miles away from Weimar – the home of German classicism. It therefore provides a particularly powerful illustration of the intimate connection between German culture and German barbarism. In fact, in 1937 the camp was literally built around an oak tree at which Goethe is supposed to have sat and discussed literature and life when he lived in Weimar in the late eighteenth and early nineteenth century. In a sense, therefore, Buchenwald – which President Obama visited last year – stands, more than any other concentration camp or death camp, for Nazism as a Zivilisationsbruch, or civilisational break. Buchenwald also plays an interesting role in debates about the nature of Nazism and its relationship with capitalism and communism. It had a special significance for the GDR, many of whose future leaders were imprisoned there, and became, as Ian Buruma described in a great essay in Granta in 1992, “in effect the founding myth of the GDR”. For the East Germans, Buchenwald was a symbol of “fascism theory” – in other words the idea that Nazism was a form of fascism, which had in turn grown out of capitalism. But although this myth of Buchenwald helped established the GDR as an “anti-fascist” state, it made no mention of the Jews who had been imprisoned in the camp (who were not commemorated at all) or of the use of the camp by the Soviets from 1945 (when it was liberated by the Americans) until 1950. Since German reunification, on the other hand, some have seen Buchenwald as a symbol of “totalitarianism theory”, which emphasises the similarities between Nazism and communism. 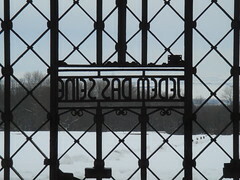 One thing I didn’t know until visiting Buchenwald again last weekend was that the famous inscription on the camp gate (above) was designed by the architect Franz Ehrlich, who had been a student at the Bauhaus in Dessau from 1927 to 1930. Ehrlich, a member of the Communist party, was imprisoned in the camp from 1937 to 1939 for his involvement in the resistance against Nazism. The camp commandant gave him the task of designing the lettering for the motto “Jedem das Seine” (“To each his own”), which, unlike those in many other camps, was readable from the inside rather than the outside of the camp. Ehrlich apparently designed the lettering in the manner of his teacher at the Bauhaus, Joost Schmidt – see in particular the round ‘m’ and ‘n’. According to an exhibition on Ehrlich last year in Weimar, “the typography was a subtle intervention against the spirit of the inscription”. This entry was posted in Nazism and tagged Bauhaus, Buchenwald, Nazism, resistance, typography. Bookmark the permalink.